Merry Christmas Everyone:) This newsletter hopefully gives you a snapshot on all that has occurred in the last few months and what’s ahead in 2017. Enjoy! What a year! 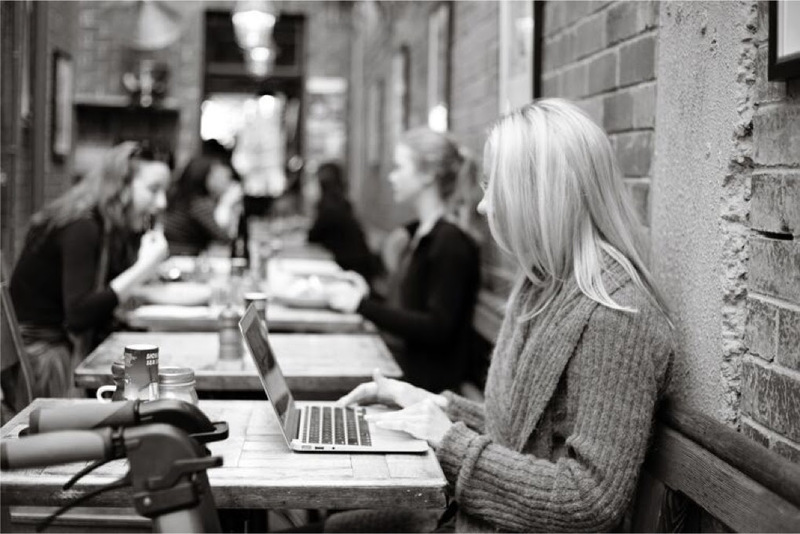 Although extremely challenging, it has been such a steep learning curve for me and generated so much change both personally and in my business. Whilst any change causes a certain level of ambivalence, it has meant big growth and has lead to some amazing opportunities. 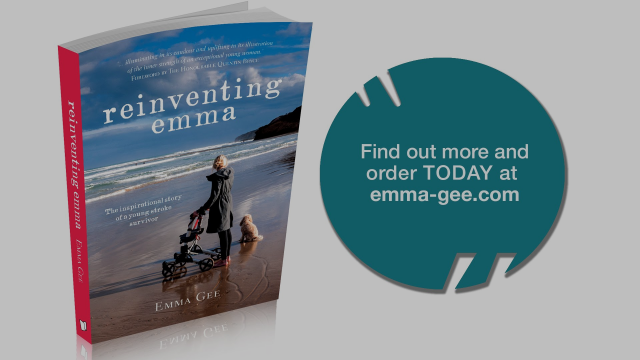 Publishing ‘Reinventing Emma’ was both terrifying and exciting. 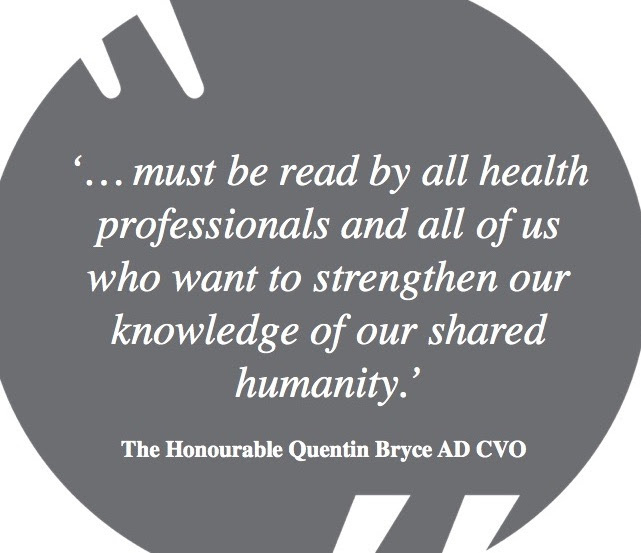 I didn’t know what the publics’ response would be – I am so fortunate that it’s been positive, I feel that hopefully it will be a good resource for other health professionals along with many of us who will encounter difficulties in our lives. It’s also great to refer to ‘Reinventing Emma’ as a resource when planning my presentations. The process of writing my book has certainly made me clearer about how I feel. Subsequently I feel I can articulate it better in a way (that hopefully) my audiences understand. I must admit delivering my final keynote this week was such a relief. But it’s so satisfying to have ended the year feeling like I’m doing what I love and still making a difference. Emma prepares for every presentation by adopting a ‘power stance’ – often in the ‘disabled’ bathroom of the venue. It’s quite effective in settling any nerves and lifting her confidence. Try it! 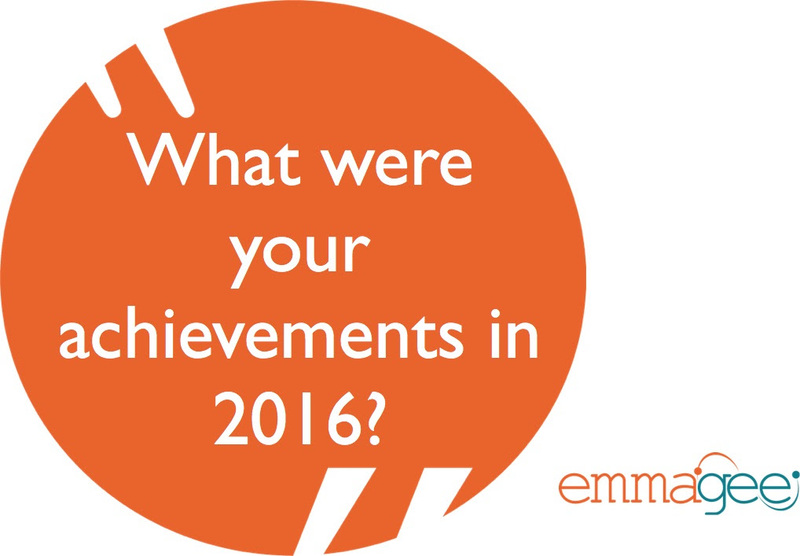 Focussing on your achievements in 2016 is sometimes hard. It’s often easier to zone in on what went wrong, what we failed to accomplish or what didn’t eventuate as planned. But in this negative mindset we are overlooking our many successes. Subsequently, we are really damaging our own self worth and ability to feel confident about the year ahead. It’s usually this time of the year where many of us are feeling depleted of energy, even more vulnerable and apprehensive about all that’s ahead. We often become even more reliant on those around us to lift us up and resentful of their attempts when they don’t perform a task exactly how we’d like. For me, towards the end of this year I injured my hamstring. Not a ‘biggy’ but enough for me to stop doing what I love and use to manage my pain. The ‘two week healing process’ didn’t go fast enough. I felt increasingly frustrated and negative. In fact, after accepting that in order for it to heal I needed to rest, when the time came to resume these activities I became reluctant to attempt them, fearing I’d only worsen my situation. Easy to be so focused on the problem, what caused it and anxious about our future moves, even pre-empting scenarios that could result. But in that mindset, we forget to live in the present moment – to just ‘be’! In my case, after listing many excuses for not resuming swimming, I eventually returned to the water. Good to get back to it, but it didn’t work out like I’d hoped. It hurt. I couldn’t swim for more than 10 measly minutes. I exited the pool feeling beaten, so frustrated. Worried about how I’d manage my pain in the future. Thankfully I was aware of my negative mindset and stopped my thought processes to focus on what I had achieved. I forced myself to list these, fill my mind with positive thoughts – I had returned to the water. I was one step closer to self-managing my pain like I always did. I was able to put my wet suit on and swim for 10 minutes. So, when you find yourself frustrated or focusing on what’s tough about a certain situation you’re in, remember to stop and think about all the positives. 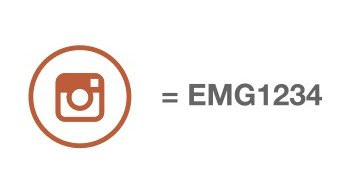 Sometimes we might need another to point these out to us. There’s nothing better than another person highlighting what we often feel too exhausted to think about or pinpoint. It’s a simple act, but by focusing on all there is to do and all we cant do, we fail to be mindful our many accomplishments. Perhaps, it’s time to revaluate that long ‘to do’ list and accept that some things will never be ‘ticked off, not for now anyway. This Christmas, why not encourage another to stop and reflect on the many good things that have taken place in 2016! 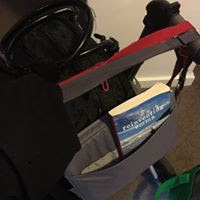 Although travelling can be quite taxing it has become such a great opportunity to better educate many different hotels and airlines on how they can improve their accessibility and service. I’ve seen some horrendous set-ups but am hopeful that changes will be made to prevent unnecessary obstacles for many. 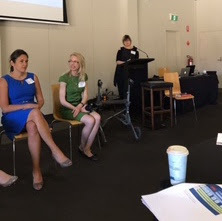 In providing these organisations and educating others on this, it has been a challenge for me and a steep learning curve. More often than not, the provider means well. I want to ensure my feedback is constructive. That I don’t just appear bitter and ungrateful for their efforts. I hope that my advocating does help and throughout the year have been so grateful for those who have done this for me when I’ve felt depleted myself. As part of all the travelling Emma does she always attempts to educates both airlines, hotels & other facilities to improve all access. 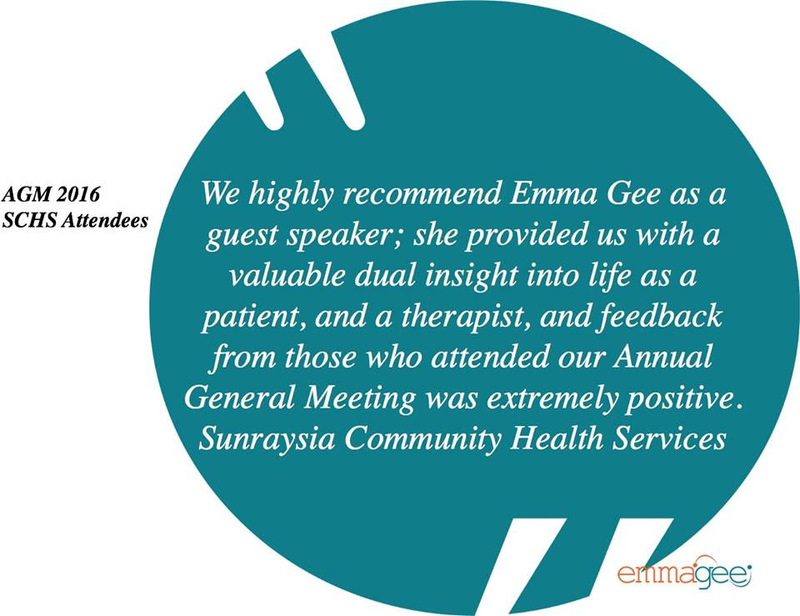 Emma continues to learn how important sustaining ‘balance’ is for her well-being! 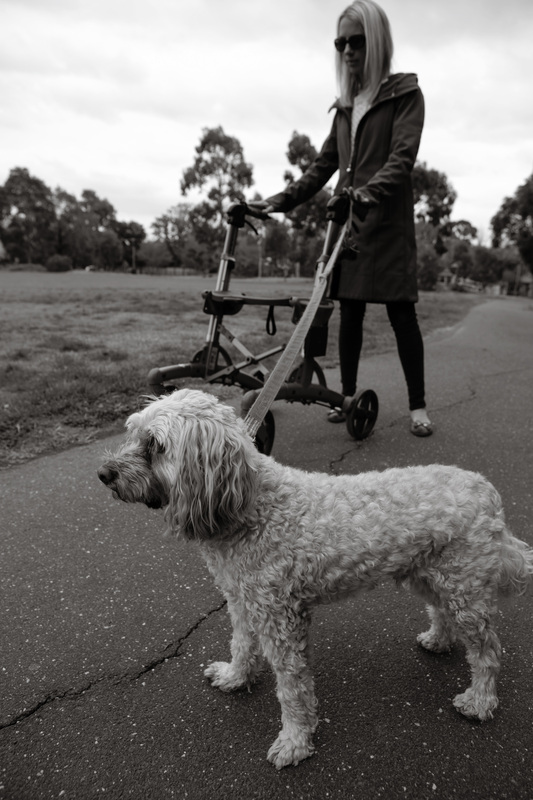 Walking her dog Gilbert is one of the ‘time-out’ activities she prioritises in her day. Wishing you a fantastic Christmas & a fantastic holiday! 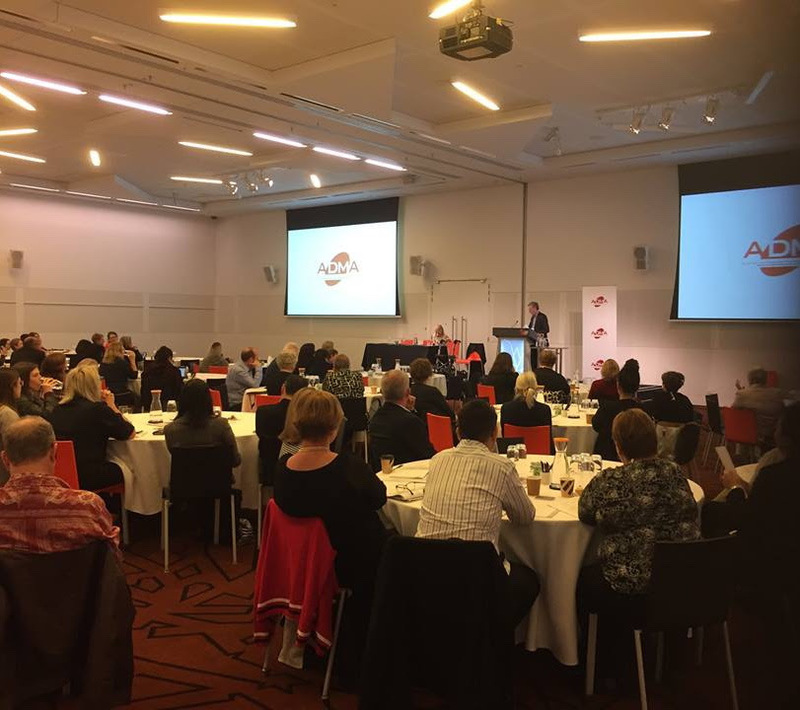 Emma presents at the Australian Chronic Management Conference at the Convention Centre, Melbourne. 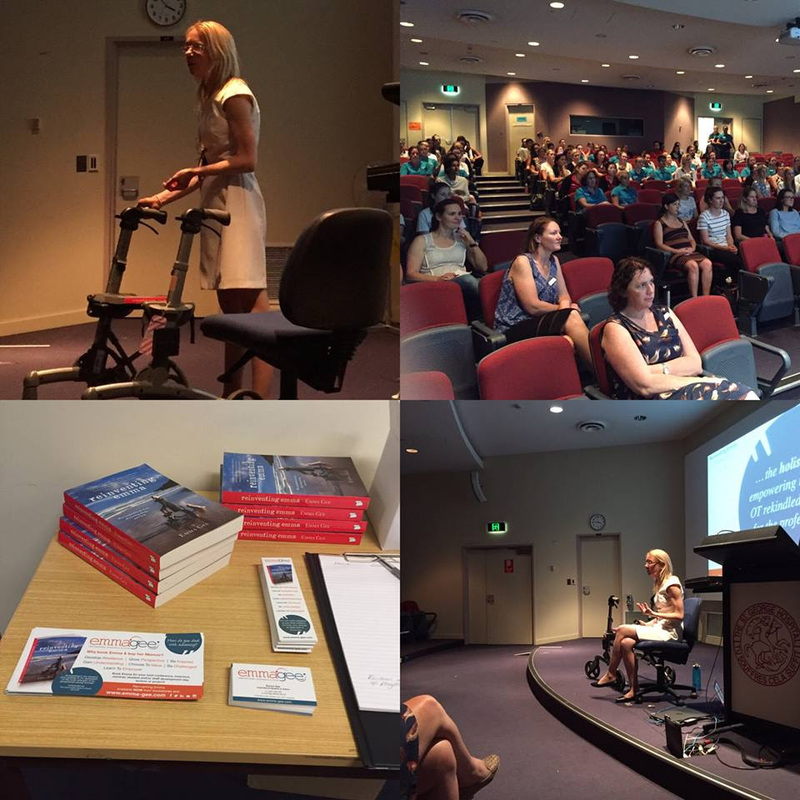 Sutherland Hospital Occupational Therapy l Professional Development Keynote: St George’s Hospital, NSW 2016. 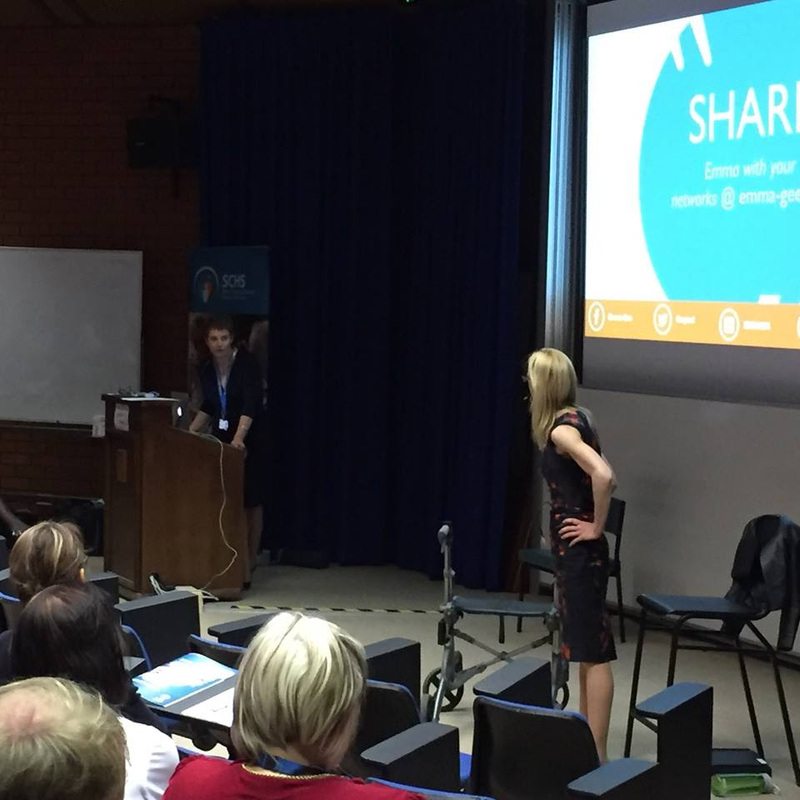 Emma presents at the 4th year Occupational Therapy Conference, LaTrobe University. Emma explores the importance of Innovation & Collaboration in improving person-centred care. at ‘The Collaborative’ forum 2016. 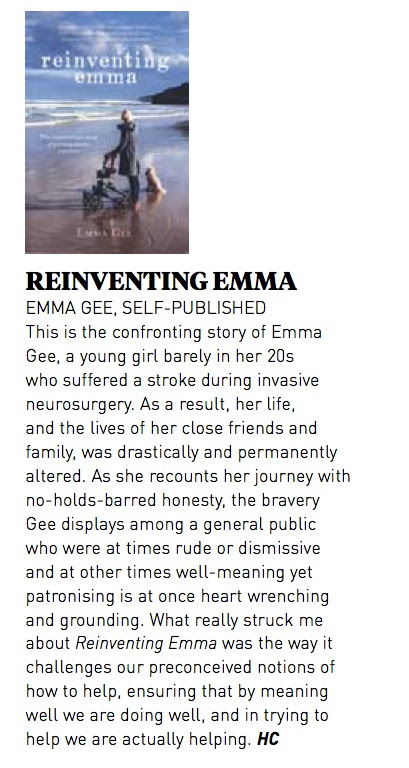 Winning the National Stroke Foundation’s ‘Creativity Award’ forReinventing Emma was such a humbling experience for me. 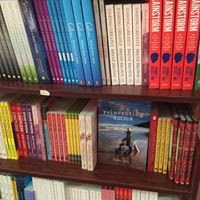 Although the writing and publishing process was so gruelling and therapeutic. But knowing that it’s empowering many others makes it all worthwhile. It’s now even been utilised by many future health professionals in their studies and knowing it’s been reviewed by several book clubs is both daunting and exciting! 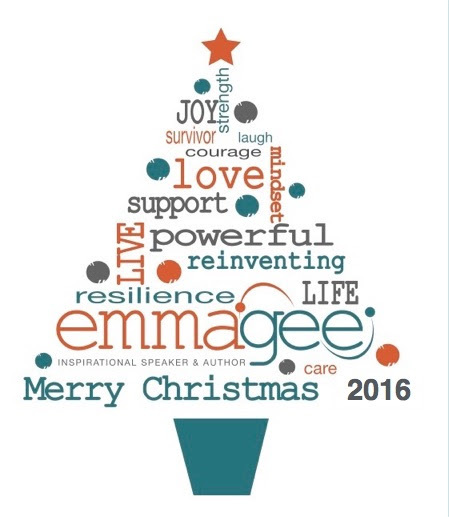 Throughout the year I have felt so supported by the wider community in promoting Reinventing Emma. 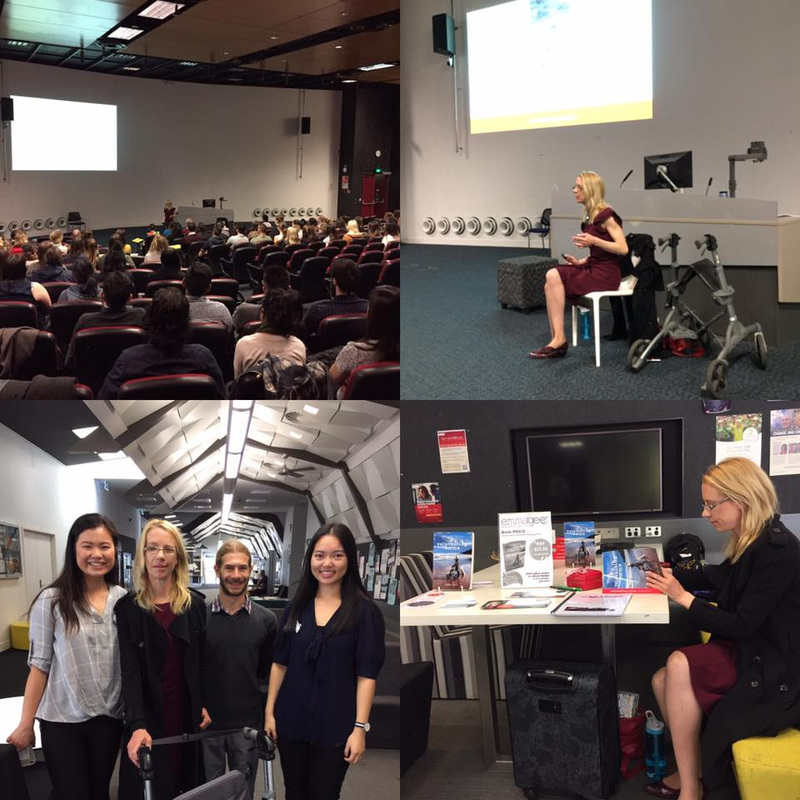 In fact, Royal Ryde Rehabilitation Centre in NSW and LaTrobe University combined with Australian Catholic University in organising ‘Book Events’ where I could discuss the writing & content ofReinventing Emma with the audience. It’s so satisfying to know thatReinventing Emma is now in print. I have also just heard that Vision Australia will publish it in audio-format for it’s members. Hopefully this enables those unable to read (due to vision, concentration etc) to access this. I am now looking into making it available in this format to my wider audience, but that is quite a feat! 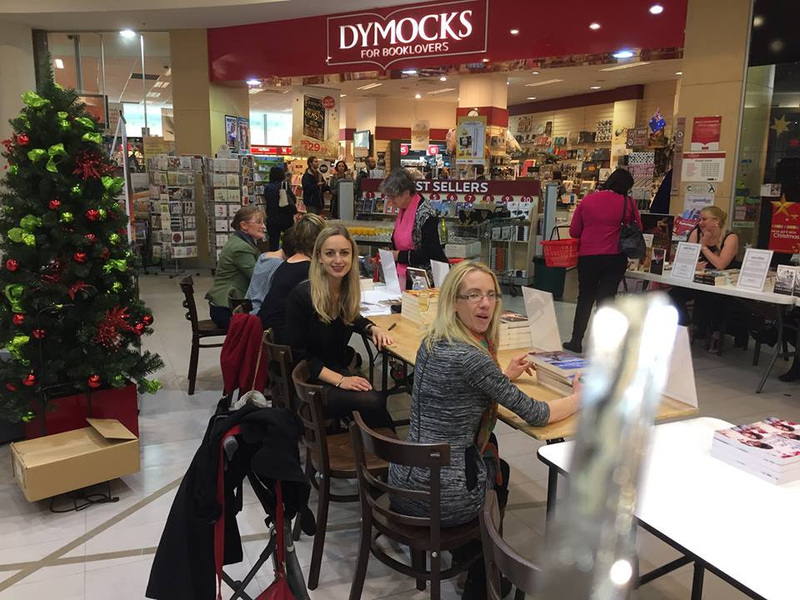 Finishing the year with a Dymocks Book Event where I could mingle with other Authors and readers was great. I’m excited that my story & all the messages are reaching a wider audience. Thanks so much for sending this through. I wanted to say how much I got out of reading your book – it was extremely well written and a gripping read. You really help the reader understand your experiences, and I sincerely hope more clinicians read it and have a better understanding of what it’s like standing in the patients’ shoes. 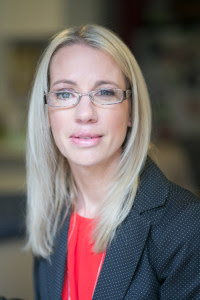 Thank you again for coming and speaking at the Collaborative event – you’re an amazing presenter and a very inspirational person! I hope that my book will continue to empower many people & all those in their lives. 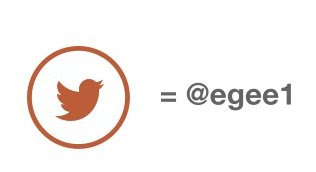 If you feel it would benefit someone you know, please recommendReinventing Emma!